Joseph Harris was born in July 1890 at South Hamlet, Gloucester, the son of Charles Harris, a blacksmith. He lived with his parents at 16, Granville Street, Tuffley (1891), 102, New Street, Gloucester (1901), and 22, Leonard Road, Gloucester (1911). He joined his father as a blacksmith working at the Gloucester Wagon Works. The early years of his rugby career were spent playing for the Gordon League, until the 1910-11 season, when he became a regular in the Gloucester 2nd XV, for whom he made twenty appearances. When most of the first team squad had to set off on a Saturday morning to start their journey to France for a fixture against Toulouse, Joe got the chance to make his debut for the senior side in the afternoon. This was against Abertillery at Kingsholm on 25th February 1911, and Joe scored the only try of the match in an unexpected 14-3 victory for the depleted Gloucester team. Joe played once more for the 1st XV that season but, in the years up to the Great War, he was not a regular in the Gloucester side. 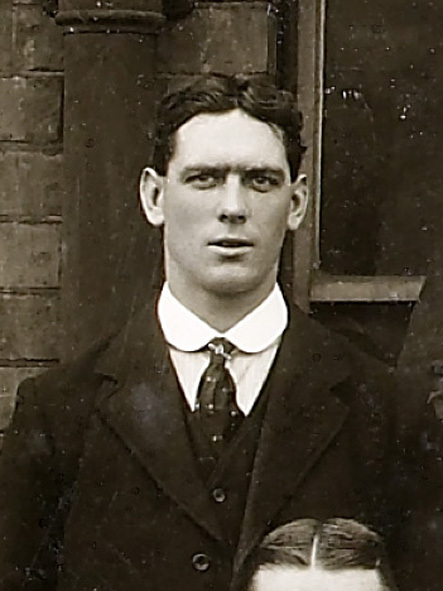 During the four seasons, 1910-14, he made only 19 appearances for the 1st XV, but 58 for the second team. He was regarded as a “useful reserve”, although, when he played nine 1st XV games in 1912-13, he was reported to have “figured prominently”, and scored three tries, two against the 1st Gloucester Regiment in a game during the Christmas holiday, which was won 15-3, and the other against Abertillery, which was won 6-0. He suffered an injury in a very rough game against Cinderford, which also put his teammates, Washbourne and Hudson, out of commission. Joe’s last senior game before the war was against Clifton on 1st November 1913. In September 1914, Joe enlisted as a Private in the Gloucestershire Regiment, and went to France in March 1915. He was promoted twice to Corporal and transferred to the Railway Operating Division of the Royal Engineers, where he received a “very superior” rating as a blacksmith (spring maker). During the war he played for the 5th Gloucesters XV and the D Company XV which won the Inter-Company Championship of 1915. Joe married Rose Mary Summers in 1917, and the couple had three children in the course of the next four years. He was not demobbed until 1 April 1919, and soon resumed playing rugby on 19th April at Kingsholm against a Canadian XV, which had been taking part in the Empire League made up of sides representing Commonwealth countries and the Services; Gloucester won 19-6. When Gloucester resumed with a full fixture list in 1919-20, Joe appeared in 16 of the 33 games. It was reported that “undoubtedly the mainstay of the team was the forwards, and in this department the City have every reason to be proud of the achievements of the front line. In all the big matches the forwards made a great impression” and Joe was described as “a regular player who rendered excellent service”. Now in his thirties, the best two seasons of Joe’s playing career came in 1920-21 and 1921-22. He made 22 appearances and scored four tries for Gloucester in 1920-21, He took part in a great match at Kingsholm on 29th January 1921, when Gloucester’s fiercest and oldest Welsh rivals, Newport, were beaten 12-9, for the first time since 1908, and lost their unbeaten record for the season. The match was played in front of a crowd of 11,818, who paid a record amount of £768 9s 6d on the gate. The match report records that “Harris, following up, fielded a kick and raced ahead. He punted over Birt’s head and the ball went over the line. Harris went after it, but was obstructed as he was about to touch down, and the referee awarded a penalty try, amidst great cheering”. It was said that “rarely has a game provided so much excitement on the ground”, and “when the end arrived the spectators swarmed on the field of play and cheered the home players vociferously, and the demonstration was continued for some minutes. Several players were borne in triumph to the gymnasium, and altogether the scene was a memorable one in the history of the City Club.” Bill Bailey of the Citizen thought that such a famous victory merited recognition, and as a result of an appeal in that newspaper for funds to provide a souvenir for the players, he was able to present each member of the side with an inscribed silver cigarette case. The team was also entertained to dinner by H G Norman, an enthusiastic supporter of the Club. Joe followed up with tries in the next two games which saw Cheltenham defeated 18-11 and Cardiff 16-11. He also scored in an Easter game, when Manchester were beaten 20-3. Joe made his County debut against Somerset at Bath on 27th November 1920, when Gloucestershire won 20-0. He retained his position in the side for the visit to Camborne a fortnight later, when Cornwall were defeated 9-6, which meant that Gloucestershire won the South West group and qualified for a County Championship semi-final. Joe played in this at Kingsholm on 17th February 1921, when Surrey were defeated 21-3. Gloucestershire chose to return to Kingsholm for the final against Leicestershire on 10th March, a glorious afternoon for Joe in front of 10,701 supporters, as he played a full part in a decisive victory, 31-4, to become County Champions. The match report records an incident with “the visitors inside the home quarter, Harris led a fine rush out, and Leicester were lucky in effecting a save”, and notes that “there were many fine individual efforts – notably by Holford, Williams, Voyce, and Harris”. In 1921-22, Joe was reported to have “fully sustained his form” as he came third in the list of appearances, playing in 33 of the 41 fixtures, and scored eight tries. Three of these came in successive victories over Old Merchant Taylors, Bath and Northampton in five days over the Christmas period. Later in the season he scored in successive games against London Welsh and Bristol, both of which were won. On 5th November 1921, Joe had his one and only successful kick for the Club with a conversion in the 16-3 defeat of Coventry, when the Club’s usual kicker, Tom Millington, was absent. For the County, Joe did not play in the group matches of the County Championship, but was recalled for the semi-final against Surrey at Richmond on 11th January 1922, which was drawn 8-8. This proved to be his final County cap, as he did not play in the replay at Kingsholm, nor in the final against North Midlands, when Gloucestershire won their third successive County Championship. Joe made eleven appearances in 1922-23, his final season. His last try was on 16th September 1922 in the 17-5 defeat of Bath, and his last appearance was on 3rd March 1923 at Swansea. He finished his career with 104 appearances, 21 tries and one conversion for Gloucester (and at least 74 appearances, 18 tries and one dropped goal for the 2nd XV), and five County caps. Joe died in 1963 aged 73 years.